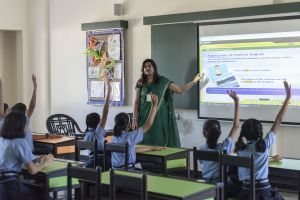 Classrooms across the school are designed as airy and colourful spaces that encourage children to enjoy their learning. Visual display of children’s work is prominent, and children’s artwork has pride of place across the school. Primary and Junior classes are a generous 76 sq. metres in size and can comfortably house several learning and play areas such as class libraries, toys, art and clay stations.